Imran’s commitment to public welfare first came to note after his decision to build a world-class cancer hospital in Pakistan after his mother died of cancer. There are many paradoxes in the life and times of Imran Khan Niazi. But, there can be no doubt of his commitment to whatever he undertakes, whether in sports, politics, volatile marriages, or support for radical Islamist causes. Born in Lahore in 1952, Imran headed for Oxford and began his cricket career there. He joined the national cricket team in 1976. I saw him in action in Pakistan in 1982 during the tour by Sunil Gavaskar’s team. He had the Indian batting lineup shaken up, with his prodigious “reverse swing”. But the Indians learnt fast to adjust to this new phenomenon. Khan is revered in Pakistan for leading his country to its first and only World Cup victory in Australia in 1992. Imran was a much sought-after bachelor. His first marriage to Jemima Goldsmith, heiress to the huge fortunes of British tycoon Sir James Goldsmith, lasted just over a decade. His second wife was London-based Pak journalist Reham Khan. The marriage lasted barely a year and Reham has come out with a book, giving torrid details of their married life. Imran soon married for a third time. This bride was a veiled Sufi soothsayer/mystic, Bushra Maneka, whose face he had reportedly never seen before marriage. Imran’s commitment to public welfare first came to note after his decision to build a world-class cancer hospital in Pakistan after his mother died of cancer. At around the same time, he partnered former ISI chief Lt Gen Hamid Gul, in establishing the Tehreek-e-Insaf party. 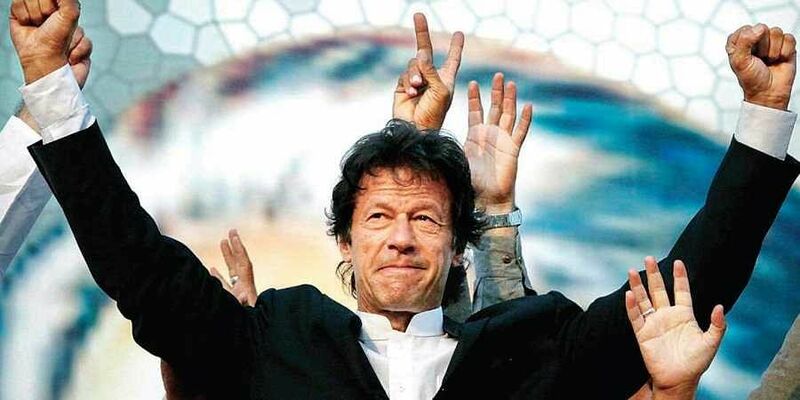 Despite his undoubted charisma, Imran’s rise in Pakistan’s domestic politics was slow. He concentrated his efforts in building support in Punjab and the Khyber-Pakhtunkhwa (KP) province. He became a national political figure in the 2013 elections, where his candidates fared well in Punjab and headed a coalition government, which performed well in the KP province. The 2013 elections saw the beginnings of serious differences between Prime Minister Nawaz Sharif and the military, particularly on relations with India and more generally the Army’s use of militant groups—from the Lashkar-e-Taiba to the Taliban’s Haqqani network in Afghanistan. The Army forced Sharif to sack his foreign policy aide Tariq Fatemi for allegedly leaking information about a meeting attended by the Army Chief, in which Sharif urged the need to clamp down on terrorist groups. The Army then acted virtually as an independent entity.